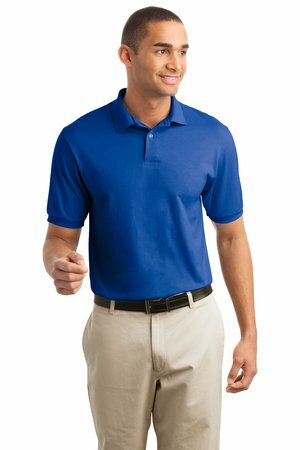 The Hanes Comfortblend EcoSmart Jersey Knit Sport Shirt – Style 054X is available in Adult Sizes: S-4XL and comes in Ash, Black, Deep Forest, Deep Navy, Deep Red, Deep Royal, Light Blue, Light Steel, Maroon, Orange, Purple and White. The Hanes Comfortblend EcoSmart Jersey Knit Sport Shirt features include 5.2-ounce 50/50 cotton/poly material. It is made with up to 5% recycled polyester from plastic bottles. Tag-free label Welt collar and cuffs 2-button placket Pearlized buttons Double-needle hem.